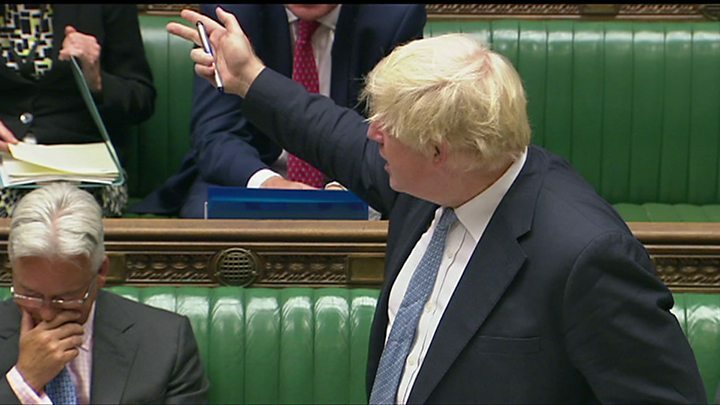 Media captionBoris Johnson's message to the EU: "Go whistle seems to me to be an entirely appropriate expression"
Foreign Secretary Boris Johnson has told MPs the European Union can "go whistle" for any "extortionate" final payment from the UK on Brexit. And he said that the government had "no plan" for what to do in the event of no deal being agreed with the EU. He said: "The sums I have seen that they propose to demand from this country appear to be extortionate." "Go whistle seems to me to be an entirely appropriate expression," he added. The foreign secretary was responding to a question from backbench MP Philip Hollobone, who urged him to tell the EU they could "go whistle" if they wanted "a penny piece more" than the money the UK had already paid to the EU since 1973. Reality Check: Will the UK pay a multibillion pound divorce bill? The question of any "divorce bill" paid by the UK is one of the first subjects to be tackled in the Brexit talks, and EU leaders say it must be settled before a future trading relationship can be negotiated. Reports have suggested the demand from Brussels could be as high as 100bn euros. The UK government has said it will not pay this amount but will settle its "obligations" as it leaves. Taking questions in the House of Commons, Mr Johnson also denied reports Chancellor Philip Hammond and First Secretary of State Damian Green had said there will be a transition period of at least three years after Brexit, when the UK will remain under the jurisdiction of the Europe Court of Justice. And he was asked if there was a strategy, either public or private, for what would happen if there was no agreement on Brexit. "There is no plan for no deal because we are going to get a great deal," he replied. His comments come after No 10 sources played down suggestions that Theresa May plans to walk out of Brexit talks in September to show defiance over EU demands for a divorce bill worth tens of billions of pounds. Mrs May has said that her view going into the Brexit negotiations was that "no deal is better than a bad deal". Mr Johnson's comments seem to be at odds with Brexit Secretary David Davis, who told the BBC last month that the government had "worked up in detail" the "no deal" option on Brexit. Asked about the foreign secretary's remarks, the prime minister's spokeswoman said: "We have said it is right to plan for all eventualities, and that planning is taking place across government." Liberal Democrat Brexit Spokesperson Tom Brake said the foreign secretary's remarks showed a "shocking level of complacency". "It is simply not good enough when people's jobs, living standards and rights are all on the line," he said. "People should be able to judge Boris Johnson on his actions not his words, with the chance to reject a disastrous Brexit deal and stay in the EU." Labour MP Chris Bryant added: "For the government to threaten to leave the EU with no deal, while boasting about not having a plan for that eventuality, is completely unacceptable." Mr Davis was asked during a House of Lords committee hearing about Mr Johnson's "go whistle" remark. In response he laughed and said: "Bluntly, I wouldn't worry, I mean you'll have to get the foreign secretary here to explain his views if you really want him to, I'm not going to comment on other ministers."